Includes vCenter Server Essentials and ESXi for 3 hosts, plus the following features: vCenter agents, Update Manager, Data Protection and High Availability. - Note: Purchase of Subscription is required! Provides an all-in-one solution for small businesses to virtualize their physical servers and reduce hardware costs while ensuring superior high application availability and data protection. VMware vSphere Essentials Kit provides a starter kit for small businesses to virtualize their physical servers and centrally manage these servers, reducing hardware costs and increasing operating efficiency with a low upfront investment. This kit includes 6 CPU licenses of vSphere Essentials (for 3 servers with up to 2 processors each) and 1 license for vCenter Server Essentials. What are vSphere Essentials and Essentials Plus? vSphere Essentials and vEssentials Plus are designed especially for small organizations just getting started with virtualization. Both provide virtualization and centralized management for up to three server hosts. vSphere Essentials provides server consolidation to help you get the most out of your hardware. vSphere Essentials Plus adds features such as vSphere Data Protection for agent - less backup of your data and virtual machines. It also includes business - continuity features such as vSphere High Availability - for automatic restart of your applications when server failures are detected - and vSphere vMotion, to completely eliminate planned downtime for server maintenance. The result is an always -available IT environment that is more cost - effective, resilient and responsive to changing business needs. For scalable solutions with more-advanced capabilities, upgrade to vSphere Acceleration Kits. Provide business continuity and always-available IT. Save on IT hardware costs. Reduce IT footprint and simplify management. Improve service levels and application quality. Strengthen security and data protection. vSphere Essentials Kits are for small businesses and combine virtualization for up to three physical servers with centralized management with vCenter for Essentials. 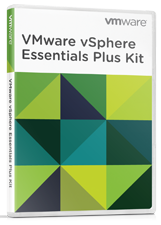 vSphere Essentials Plus is also available with vSphere Storage Appliance. VMware vSphere Essentials Kits are for small businesses and combine virtualization for up to three physical servers with centralized management using VMware vCenter Server for Essentials.